This is a selection of my Curtiss F9C's and Consolidated N2Y's for the experienced modeller to add to the AMT kit "U.S.S. AKRON/U.S.S. MACON". 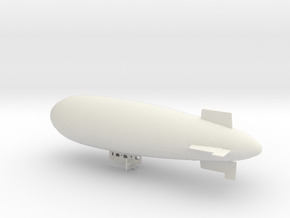 Admiral Moffet's Ford Trimotor is included so that you can have him visitting the airship on one of his rounds of inspection! 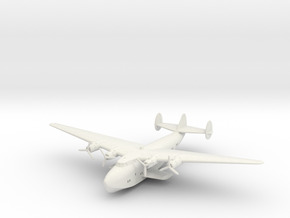 The hangar in each of the US Navy's lighter than air (LTA) carriers, Akron and Macon, was designed to hold five aircraft. There was an additional exterior hook-on position (known to the pilots as "the perch") aft of the hanger where an operation-ready plane could be carried. Each carrier's complement of aircraft was known as the "HTA Unit" (Heavier Than Air Unit) and the Curtiss F9C was the main type. Before these were delivered, Consolodated N2Y's were the primary trainer aircraft and these were subsequently used in the role of "running boat" for the carriers, ferrying crew, ad hoc supplies or even visiters, to the mother ships. Once an F9C was flown aboard the carrier, its' undercarriage would be removed and replaced with a long-range fuel tank. 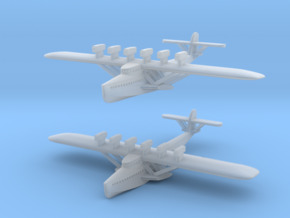 This set of ten 1/520th scale aircraft provides the opportunity to fit out Akron or Macon with numerous permutations of how the ships would have been operating. There is a choice of an F9C or N2Y hanging on the "trapeze", F9C's with or without undercarriage and an N2Y for mounting in the hangar or hooking onto "the perch", and three free-flying planes for displaying alongside the carriers. Look carefully and you will see a pilot figure in some of the planes as approprate. 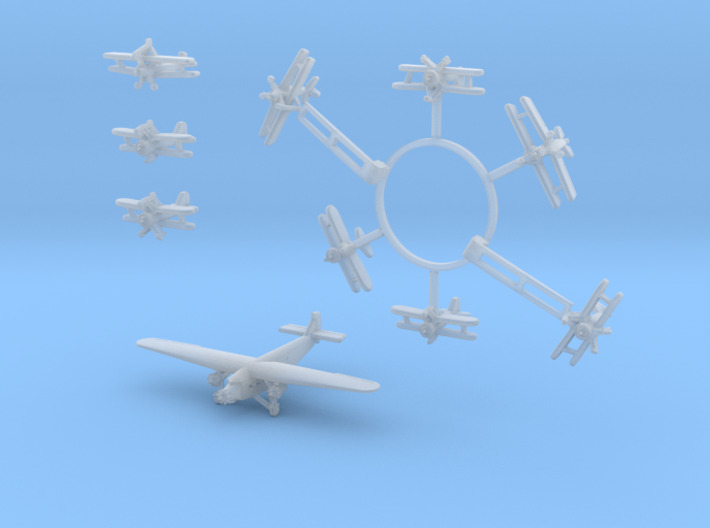 This set has been reissued after the Shapeways' May 2017 Frosted Detail plastic price changes with modifications to bring the price back as close as possible to the original. Specifically, several parts that were separate have now been sprued together.